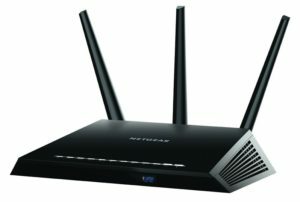 What is a Wireless Ethernet Bridge? 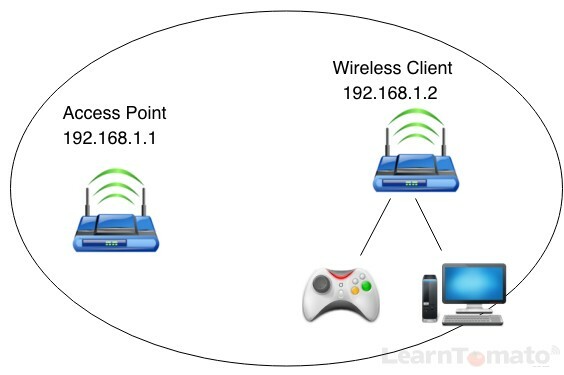 A ‘Wireless Ethernet Bridge’ works very similar to ‘Wireless Client’ mode. The main difference being how you configure the subnets. As with ‘client’ mode, it doesn’t matter if you have administrative rights to the router, or what kind of router it is for that matter. However, it is recommended that you do have administrative rights to the router when using this mode for an Ethernet bridge. The main difference with this mode is that the client router is bridged to the host router (the primary access point) using the same subnet. This means that the client router resides in the same subnet and passes DHCP addresses from the Access point to the clients. As a result, client computers think they are connected directly to the access point. 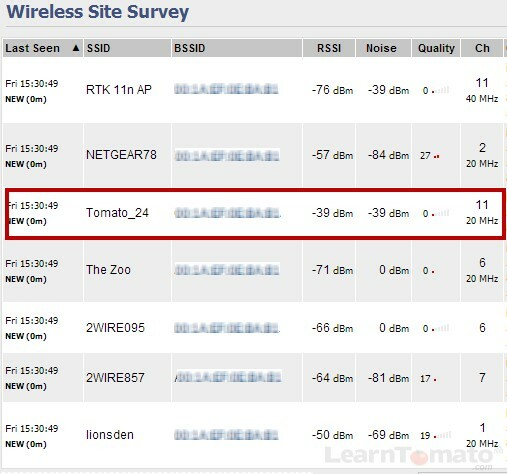 As with other wireless bridge modes in Tomato, you’ll want to gather some information about the host router (such as the SSID, WiFi channel, etc). With ‘Ethernet Bridge’ mode, you should have administrative access to the primary host router. 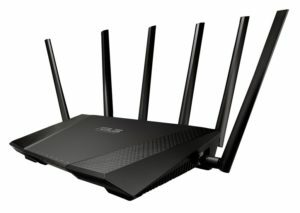 After all, any client devices connected to either router will be seen on other devices, regardless of which router they are connected to. If you have administrative access to the access point, you probably already know what the IP address is. If not, connect directly to the primary access point using a laptop or other wireless computer. The IP address of the access point is located next to ‘Default Gateway’. Because you are using ‘bridge’ mode, it doesn’t really matter what you set the LAN IP address to. Just keep in mind that if you set it to something outside the subnet of the host AP, you’ll be unable to reach the admin panel of your client router. For this reason, I generally recommend using an IP address that is within the subnet of the primary router. So, if your Access Point has an IP address of 192.168.1.1, you might set the client routers IP address to 192.168.1.2. In doing so, keep in mind that client computers connected to either router will be able to see other devices on the network. Be sure to disable DHCP. You won’t be needing it because the primary router will handle DHCP requests for the entire network. When you select the ‘Wireless Ethernet Bridge’ mode, you’ll notice that some options disappear/change, such as the WAN port at the top of the page. As with Wireless Client mode, enter the parameters to match the host router. Enter the SSID, password and security details. 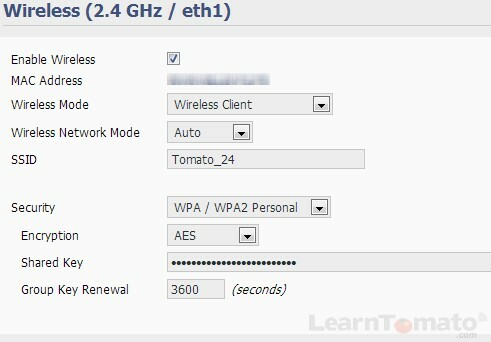 Please note, that Tomato does not support WEP when using bridge mode so you’ll need to select WPA or WPA2. 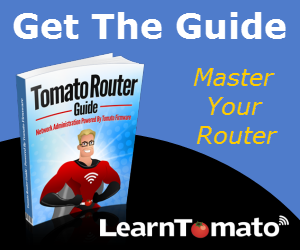 Make sure that both routers are using the same security type (WPA). When finished, click ‘Save’. TIP: If your host router is using WPA2, but you are unable to connect your client router to the host router, try changing the security type to ‘WPA / WPA2 Personal’ as show in the image above. As with ‘Client Mode’ we discussed earlier, depending on your IP configuration, you may need to restart your computer or renew the computers IP address in order to connect.